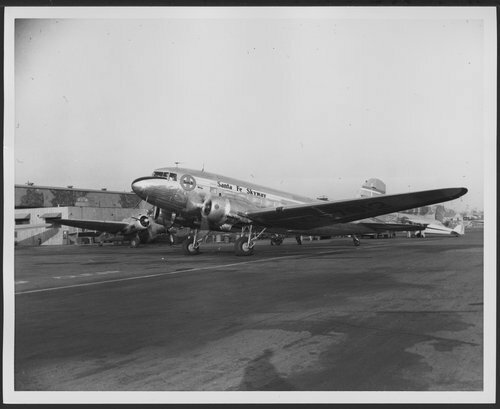 This black and white photograph shows the first plane of the Atchison, Topeka & Santa Fe Railway Company's skyway aircraft in Los Angeles, California, prior to its inaugural flight for Chicago, Illinois. The war surplus Douglas C-47 was equipped with a new type refrigeration unit developed by Douglas Aircraft engineers. The "Flying Refrigerator" was capable of carrying a 5500 pound payload of refrigerated perishables or a 6500 pound non-refrigerated load.